President Donald Trump returns from a 12-day, five-nation trip to Asia with a pocketful of business and trade deals and, arguably, improved relations with a number of important countries in the region. But critics say those benefits have come at the expense of America's reputation as a champion of human rights. 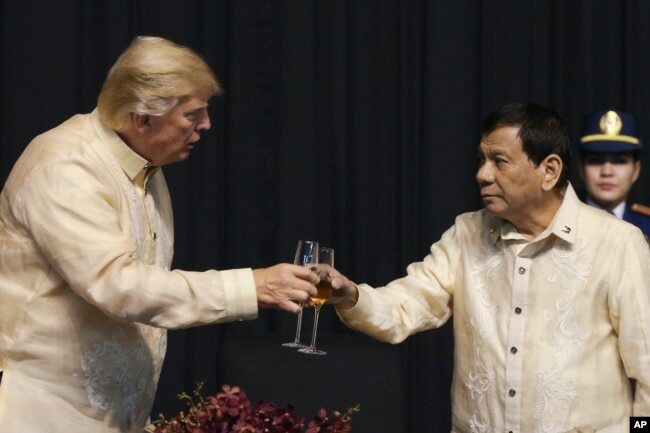 "The United States' voice on human rights has basically disappeared," said Brad Adams, Asia director for Human Rights Watch. "Trump has made clear that he is only interested in having personal relationships with leaders of other countries, and if they flatter him and roll out the red carpet, then he's happy and they can then essentially get away with murder." On the flight home, Trump defended his strategy of building personal relationships, arguing that he had made progress on issues such as reining in North Korea's nuclear ambitions, helping to win freedom for several U.S. college basketball players accused of shoplifting in China and securing the future of a key U.S. military base in the Pacific. "Relationship is always important. It doesn't mean it's necessarily close. It's really a relationship based on respect," Trump said. "To me, a relationship based on respect is much more important than anything else, including friendship."